Vivo Confirms January 24 Launch Date for APEX 2019 - Playfuldroid! Through Weibo, Vivo has confirmed that it will be holding a launch event on Jan. 24 to announce the APEX 2019 phone. Just as the Vivo APEX concept phone was unveiled in January last year, in the same way the upcoming APEX 2019 could be a concept model. There is no information available on the specifications and features of the Vivo APEX 2019 phone. The Weibo post that accompanies the launch teaser reveals that it will be arriving with futuristic features. 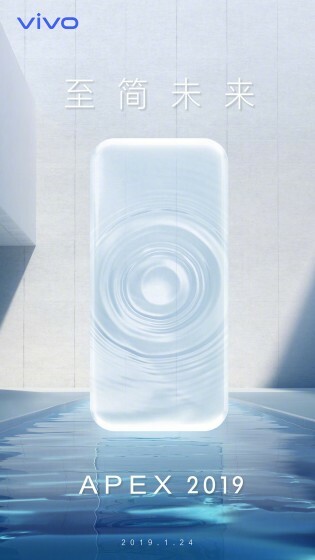 The teaser image has water ripples on the screen while the handset seems to taper towards all the four edges. The rumor mill has claimed that the handset will be equipped with a very innovative design. Not only the handset will feature a bezel-less display, but also it may not feature any ports or physical buttons. The Snapdragon 845 chipset powered the Vivo APEX concept model. The smartphone was made official as Vivo NEX in the month of June last year. Hence, it is speculated that the Vivo APEX 2019 could be the first Snapdragon 855 powered phone from the company. Probably, the handset may debut with a different moniker later this year.